Grab your scarf and hat, another frigid day is in store Saturday after record-breaking cold on Friday. Temperatures in Central Park dipped to 25 degrees, beating a record of 27 degrees set on Nov. 10 in 1914. A brutal blast of Arctic air continues to freeze the tri-state -- which saw temperatures in the 70s just a week ago -- through Veteran's Day. 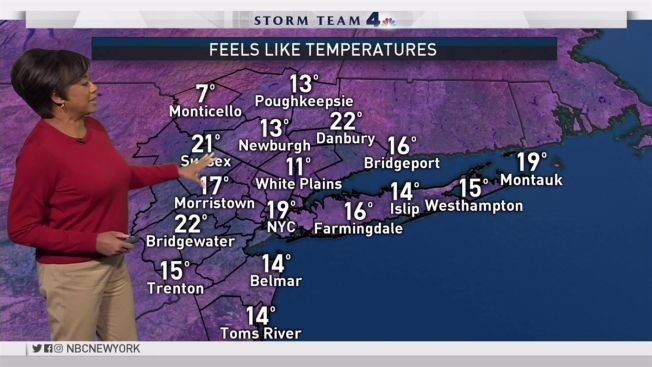 Storm Team 4 says glacial temperatures Saturday morning will likely break an 84-year-old record low of 28 degrees set in Central Park back in 1933. Records at other locations may also shatter, including a record low of 29 degrees set at LaGuardia in 1956 and a record low of 25 degrees set at Newark that same year. A freeze warning is in effect until 8 a.m. Saturday for all of New York City, Long Island, and most surrounding suburbs. Storm Team 4 says the chill will kill crops and other sensitive vegetation, essentially ending the growing season for the year. There will be some relief later in the day Saturday as the sun comes out, winds settle down and temperatures nudge into the upper 30s, Storm Team 4 says. Fortunately, the arctic blast won't last long. Temperatures climb by about 10 degrees, up to a high of 49 on Sunday. By Monday, they're back in the low 50s, where they're expected to linger through the rest of the week.